Bicarbonate of soda in kraft paper bag. A multi-purpose product. An affordable way to clean your home, toxin-free. Instead of buying all-purpose cleaner, limescale removers, chemical laundry detergents, softener, air fresheners and other household products… think first about Bicarbonate of soda. Use for housekeeping only. This a technical grade and not food grade. Bicarbonate of soda in kraft paper bag. A multi-purpose product. 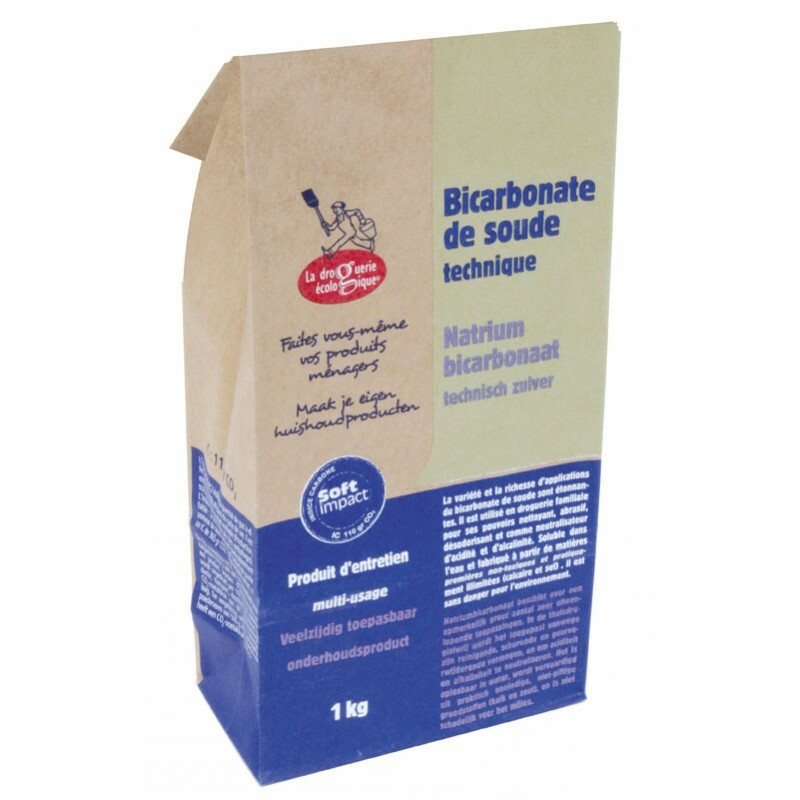 Bicarbonate of soda has numerous environmental advantages and is an affordable way to clean your home, toxin-free. - Porcelain stained by tea, coffee - Scrub using a cloth soaked in baking soda, the stain will disappear in no time. - Fabric softener: Put 1/4 glass of bicarbonate and 3/4 glass of water in the rinse tank of the machine. - Stain remover: Soak for a few hours in a bowl of hot water with a glass of Bicarbonate of soda. Then rinse a little and put in the washing machine. - Carpet cleaner: carpets and sofas: sprinkle with Bicarbonate of soda, rub, let stand for 1 hour, then vacuum. The fabric will be cleaned and deodorized. - Laundry: Add bicarbonate to your laundry bin while washing in white. To increase the effectiveness of your eco-friendly detergents (soapnuts for example), add Bicarbonate of soda during your washing cycle: it acts as a deodorizer, revives the colours and avoids the accumulation of limescale. - Laundry deodorizer: To remove the chlorine odour from your bath towels, add bicarbonate when washing, or in the rinse cycle water. - Descaler: Washing machine descaler: To prevent the formation of scale in your machine (valid for the dishwasher too, coffee maker, teapot by adjusting the dose), perform once a month, wash with 150 g of baking soda. - Clean, floors, toilet, surfaces. Clean chrome, stainless steel, gold and silver with your paste. Apply, leave briefly, rinse with hot water, then polish. - Scouring powder: apply bicarbonate, rub and rinse. - Create a powerful cleaning cream with vinegar: Attention, the chemical reaction makes the mixture lather! Protect yourself well before you start; or replace the vinegar with clean water or mix ¼ cup of bicarbonate with liquid vegetable soap. This mixture can be used to remove food stains and/or mould in a refrigerator and a freezer in particular. Depending on the importance of the stains, increase the proportion of sodium bicarbonate in the water (3 measures of bicarbonate for a measurement of water). Apply this scouring cream with a sponge or cloth. - Detergent for the oven: Make a paste with bicarbonate and water. Apply this paste on the oven walls and leave on for 12 hours. Then remove this paste with soapy water and rinse. Or spray the walls of the oven with water, cover with Bicarbonate of soda, spray again. Leave it all night. Remove the powder with a vegetable soap, rinse thoroughly with water. - Unclog the pipes: put this mixture in the pipe. Add 250 ml white vinegar. Wait 20 minutes, then pour boiling water. - Clean the pipes: Leave for a minute, after running the water. Repeat the operation if necessary. - For refrigerators, ovens, bins; sprinkle the bicarbonate of soda on a sponge, then rinse with clear water. Or put a cup of bicarbonate of soda in your refrigerator. - Air Purifier - Dissolve bicarbonate of soda in warm water, then add lemon juice, put it in your refillable purifier. You can also have cups containing bicarbonate of soda in the room. - This has no toxicity to the body or the environment but can be toxic if swallowed. Keep out of reach of children. - Do not clean aluminium with baking soda (but is suitable for all other metal surfaces and alloys).